That’s where the largest Anglo-Saxon intelligence coalition in existence, comprising Australia, Canada, New Zealand, the United Kingdom and the United States comes into play. The anti-Chinese efforts of this coalition known as the Five Eyes (FVEY) has recently been joined by Germany, Japan and France that want to oppose Chinese investments into various regions of the world. American politicians would typically describe activities of this coalition as consultations with like-minded partners, aimed, for the time being, at countering the rapid rise of Beijing and its two major infrastructure initiatives: the One Belt One Road (OBOR) and Made in China 2025. However, Beijing is not the only one to suffer from the activities of FVEY, as this body has reportedly developed a number of anti-Russian operations as well. This trend seems particularly disturbing, especially if one is to get acquainted with the statement issued after the recent Five Eyes meeting on the Gold Coast of Australia, learning that FVEY would use “global partnerships” to accelerate the sharing of information to secure its goals. The Five Eyes played a pivotal role in the adoption of a number of anti-Chinese legislative initiatives, including the one known as FIRRMA, which gives Washington new powers to block certain types of foreign investments. The text of that legislation mandates Donald Trump to conduct a “more robust international outreach effort” to convince allies to adopt similar protections. Lately, London in order to secure its favorable relations with Washington has become a primary actor in the deployment of the international anti-China campaign, since it has no friends to turn to, especially after the loss of all of its authority and influence within the European Union. This becomes evident if we take a look at the role the UK plays in a series of attacks on the Chinese high-tech giant – Huawei. It was MI6 that reminded its close intelligence partners, namely the US, New Zealand and Australia that Huawei started to play too prominent a role on the Western markets, which resulted in this Chinese company getting banned from providing technology for their 5G super-fast networks. Then, under the supervision of MI6, Canadian authorities have arrested Huawei’s chief financial officer Meng Wanzhou, fulfilling a formal request of Washington, that suspects her of alleged violations of anti-Iran sanctions. The funniest part here is that the Commonwealth hasn’t put its own sanctions against Iran in place, so this move against the Chinese cellular-technology giant was completely illegal even from the point of view of Canadian law, let alone the international one. What’s even worse is that the detained Chinese financial officer happens to be the daughter of Huawei’s founder, Ren Zhengfei, as she also serves as the company’s deputy chairwoman. As for London’s role in the fulfillment of various dirty tasks on the part of Washington, those seem to be already well-known to NEO’s readers. Suffice it to recall that back in 2017, the former judge of the New Jersey State Superior Court, Andrew Napolitano told the media that the Obama administration made an informal request to British intelligence agencies to wiretap Donald Trump so that no American fingerprints was left behind. The state of cooperation between American and British intelligence agencies doesn’t end up with developing all sorts of cunning plans, but it also involves the establishment of total surveillance over the citizens of the US-aligned states, which has long been on the agenda of the Five Eyes. It won’t take you much time to find traces of this cooperation in the American and British media, that are kin on discussing how FVEY has been taking full advantage of such well-known spyware as PRISM, Xkeyscore, Tempora, MUSCULAR and STATEROOM. Moreover, London doesn’t even seem to be embarrassed over the fact that ever since 2007, the NSA has been allowed to collect all sorts of personal information of British citizens and store it in its own databases. Prior to that, Britain would typically oppose any attempts made by the NSA to collect any sensitive information on its citizens, only allowing the latter to store the UK phone number database in its systems. Its also curious that back in 2005, the NSA started consultations on the possibility of collecting personal data of every citizen of the Five Eyes member states without notifying its allies. It should also be noted that the whole notion of the supranational intelligence alliance was brought into existence by Anglo-Saxons with the sole goal of bypassing domestic legislation of the Five Eyes members states that prohibits mass-surveillance in one form or another. 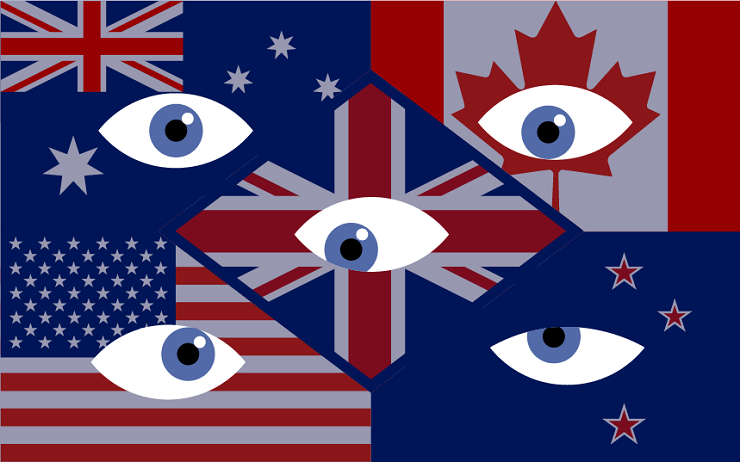 We should not forget that, in addition to the Five Eyes, there’s also an alliance known as the Nine Eyes that comprises the five above mentioned countries plus Norway, Denmark, Holland, and France. There’s also reports on the Fourteen Eyes and Forty-one Eyes alliances, but they don’t seem to enjoy the same level of cooperation as the initial group. Once the dubious activities of the Five Eyes became known to the public, numerous human rights activists across the Commonwealth started attacking the group, accusing it of forcing governments to “do dirty work” on Washington’s part. For example, in Canada, judges were outraged that local intelligence agencies handed over surveillance over Canadian citizens to other states within the framework of the alliance. The European Union has also expressed its concern that members of the Five Eyes are collecting and sharing information on EU citizens in the interests of the United States, paying no heed to European laws that prohibit such activities. In this regard, the total lack of any public criticism of anti-Huawei campaign of FVEY is really surprising. After all, if the general public doesn’t put its foot in the door of such dubious practices, then there’s no telling what the Five Eyes can come up with tomorrow, jeopardizing both civil and human rights of their own citizens in whatever way they see fit.